Thanks to the Charlie Company Website viewers; our years of searching for our old Nam buddy, Otto Zollondz has ended with a sad outcome. A friend of Otto’s (Jeff Walden) has helped us find the answer to the location of yet another brother. 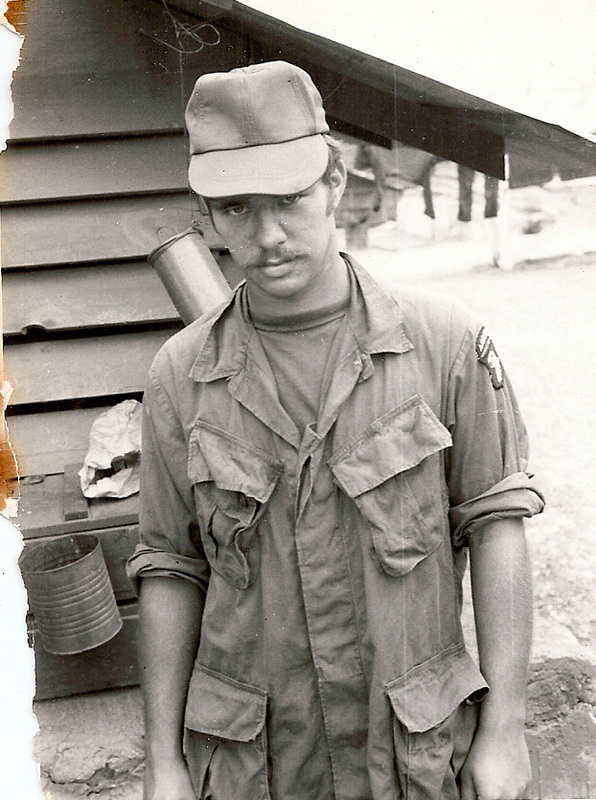 I talked the Cathy Zollondz today and it has been confirmed that Otto E Zollondz who served in Viet Nam with Charlie Company 2nd/506th Infantry 101st Airborne 2nd Platoon in 1971 died on April 2nd, 2005 of Kidney Cancer. Otto served with Charlie Company under Capt Bob Seitz. Otto’s wife Cathy says the VA stated that Kidney Cancer was not included in the Agent Orange list of diseases. Otto was a good friend, and he will be remembered as a brother Currahee who has reached his rendezvous with destiny. I want to thank you and tell you how much your email means to me, it was very interesting and unbelievable to get this real picture of what a lot of Otto's days were like in Vietnam. My husband and I used to watch the news every night and see these young men in the jungle fighting. Now I know that my brother was part of those operations. Otto comes from a strong German background, but it caused tears when I first read about him being the lead after you left, and chopping thru the jungle. I was not surprised when you talked about what a brave soldier he was, Otto always worked hard and cared for others. Your description of those days in the jungle with those incredibly awful conditions were really so interesting and vivid, I appreciate your first-hand description even though it was hard to read. I have re-read it several times and know why Otto did not talk about it with his family. It had to be an experience that made such an imprint on him personally. It would have been great if Otto could have attended one of the reunions you spoke of to see those guys who made it home. Those guys were all so young in the war; I can only imagine that seeing the guys in your unit now would have been a good thing for him. Before Otto left for the military, he took a long motorcycle trip to the East Coast. I remember a phone call from him telling me he was on the farthest eastern point on the East Coast. So, when he returned home from Vietnam, he bought a larger motorcycle and went on another trip to the West Coast. On that trip he unfortunately was involved in an accident, being hit by a car which totaled his motorcycle and hurt his leg. He said he had on his Army boots but his leg was still injured. He recovered from that accident and had to buy a new bike to finish his trip. He loved being on that bike, he even talked me into taking a ride on the back! I did not have the same love for the speed!! It is very interesting to read in your email that he was going to redo a car and make a fast car when he returned home from Vietnam. Well, I guess he liked the cycle better and probably the feeling of speed! He was also at one point in his younger years a parachuter! He had a huge red parachute, it scared our family thinking about him jumping from a plane. But, he just loved it and said the feeling was indescribable! Otto went to college at Southern Illinois University in Carbondale, Illinois. He graduated with a degree in Mechanical Engineering and met his wife, Cathy who was also a student at SIU. Otto and Cathy were married and Otto went to work for Kraft foods in Champaign, Illinois. He and Cathy built a new house in Mahomet, IL, and their first child Megan was born. Otto did a lot of the work building his house, our Dad would also come over and help when he could, which was fun for both of them. The house turned out very nice and they lived there for a few years, but then Kraft offered him an opportunity at their operation close to Chicago. So, they moved to a small town and a house with a great yard, which they both enjoyed. They lived there for a short time before Kraft once again offered Otto another promotion in their Atlanta, Georgia operation. They loved the weather, no snow and another yard with a lot of plants which they loved. It is a lovely home, they had just completed finishing the basement before Otto found out about his cancer. The move to the Atlanta area eventually evolved into a position that required a lot of traveling. He was looking forward to retiring because the traveling did not really appeal to him. He did tell me that he bought a lottery ticket every week! Otto's cancer diagnosis was such an unbelievable shock to me, I can still remember the phone call from him telling me about it. All of us felt like he would beat it, we saw him go thru all the tough chemo and watched as he was so brave, strong and positive. When he received the diagnosis he was already in stage 4 kidney cancer. He had surgery where they removed a tumor the size of a football. It was really so very hard for both he and Cathy, they were still young and Claire, their youngest daughter was still in high school and their son had just started college. Megan had just married a year before and was working as a special-ed teacher, just like her Mom. We all prayed and hoped he could beat it but as we all know, sometimes the Lord has other plans for us. Otto would have been a great Grandpa, Megan and Drew have a beautiful little boy that always has this great smile on his face, and he looks a lot like Otto! They would have had a great time. Megan is expecting another son soon and Matt, their son is expecting a baby soon also. So, Cathy will be a grandmother to 3 sweet little ones. We all miss Otto but he left his family with a strong commitment to family. He enjoyed his life and had so many, many friends. I know he would have enjoyed having a conversation with you Gary. I can imagine you would have just continued on just as if the years did not exist, that is what usually happens when good friends meet after years apart. I am so glad you have found us, your words are special to me and my sister and our whole family. This is history and I plan to share it with our boys and our grandchildren. I am so proud of Otto and know that the experience in Vietnam was very difficult, but am comforted knowing that he really did have very special life-long companions. Thanks to you again and those involved in making this connection to Otto. It means so much to me and my sister and our whole family. I am now searching for photos of Otto that might give you a little peek into some of Otto's escapades after he got home. We will look forward to more communication with you. My name is Gary Gilliam and I was a close friend to Otto in Viet Nam. We talked about home and family many times. Otto loved to dream about coming home and buying a hot-rod car. He talked about wanting a roadrunner or charger. I hope he got to live his dream. Otto came in to our unit later in the year of 1971 and things were changing with 2/506th Infantry 101st Airborne Division. It was not a good time for us at that point. Men were finishing their tour of duty and the size of the battalion was dwindling. This made things a little touchy in the field while operating and covering the same ground with less men in the units. Also the older more experience were beginning to disappear leaving good men like Otto to learn on their own. I was one of the old guys (at the age of 20) who remained in the jungle to teach the new (we called cherries) guys how to go about daily patrols, sneak through the jungle unnoticed, recognize ambush sites, bunker complexes, immediate danger and how to respond to live another day. Days were hard with the humid heat, mosquitoes the size of butterflies, centipedes looked like walking rulers from school, spiders, snakes (cobras, bamboo vipers and what some called a 3 step snake), and many other surprises found on a daily basis. Because we lived in the jungle sometimes for months at a time we would create a circle at night making 8 to 10 positions of 3 men per position. Taking turns throughout the night listening for the enemy to try to sneak into our position; we lived with that thought every night and each man had to stay awake for 3 to 4 hours in the darkness of night (many times wondering if we were awake or dreaming that we were awake, sometimes hard to tell in the blackness of night). If there were visitors we would stay awake all night just to make sure they knew we were alert and ready. We would be carried by helicopters (called CA'd Combat Assault) to the middle of jungle, jumping off the choppers with rucksacks that weighed 100 lbs. or more on our backs. Within these rucksacks we carried all the food we needed for 5 days (usually 5 cans of c rations because of the weight of each meal), a poncho to make a tent like hooch each evening when the monsoon rained like in Forest Gump (that part was true), a poncho liner (light weight blanket), extra ammunition, claymore mine, C-4 explosives, 6-8 hand grenades, 100 rounds of machine gun ammunition, 4 quarts of water (8 lbs. ), 4 smoke grenades, hand flares, extra pair of socks when available, but the thing we could not live without were in our ditty box; (water tight ammo can) that we carried our pictures, pen, writing paper, letters from home we would read over and over again, toothpaste, toothbrush, razor, mirror, candy, cigarettes, deck of cards and anything we wanted to keep dry. Otto was a good soldier and very brave. He would be the one that would take over my place leading the patrols, known as the point man. The first man in the unit that would use a machete to cut through the vines, and jungle. The one that had to be so aware of his surroundings or the unit could walk into an ambush. Everyone trusted the point man to basically keep them alive. He did well as I learned he was excellent after I left country. Our unit Charlie company, 2nd battalion of the 506th infantry 101st Airborne was and is a prestigious unit from World War II. It was the unit that the HBO movie Band of Brothers was about. The 506th was in many famous battles then and in Viet Nam. The Eagle on the shoulder patch with the Ace of Spades on the helmet was the cymbal of the unit, his unit. 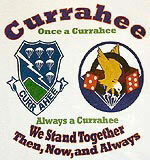 We were known as the Currahee’s (in Cherokee meaning Stands Alone). 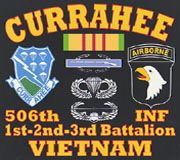 Charlie Company (Fox) 2nd 506th inf 101st Airborne still exits and is in Afghanistan today, we know them and they know us as the old Currahees. We have a motto "Rendezvous with Destiny"
You should be proud of your brother, he was a brave and honorable soldier! Thank you for your kind comments! We, the members of Charlie Company, have created this website to honor the sacrifices that we all made and the friends that we lost during that point in time in our lives. We also want to honor our friends that have passed since out return home. Every man listed upon our website has earned a special place in the hearts of their follow Currahee Brothers at Charlie Company. The bond that forms between men in the furnace of war is quite close with each looking out for the other. It is sad that we couldn't have located Otto earlier so he could of had the healing and peace of mind that attending a veterans reunion would have brought to him. There are many that we are still looking for. It always really touches my heart when a family member of a lost one contacts me. We fully understand the feelings and emotions that you are going through. We have all been in that position a few times in our lives and it is never easy to go through. But it is nice to have a place of remembrance that you can return to as those feelings well up within you. I want you, the family, to know that I would be happy to add to Otto's Tribute Page any family photos or posting that you like to place there. Feel free to contact me at any time if you would like to do that and I would be happy to assist you. If it is OK with you and the other family members, I would like to post your emails upon our Remembrance Page to encourage the friends of these fine men to write-up some little stories about the guys that they remember as they served together. You know, it is still very difficult for the men of Charlie Company to verbalize about their friendships and experiences during the war even after forty years. But in doing so, they will find a healing that takes place within them. It is our hope that we reach as many of the men as we can. Thank you again, and I look forward to hearing back from you and some of the other family members. P.S., I didn't have any information upon his surviving family and children and I would like to list you all upon Otto,s Tribute Page. My name is Jeanette (Zollondz) Short. I am Otto's older sister. Otto was 13 years old when I was married. We lived in Milwaukee at the time Otto left for Vietnam. I can remember coming home and, along with our parents and sister Margaret, taking him to the airport when he left. We tried to send him packages every month, with snacks, to connect him with home. We hope it helped. Otto did not talk about his life in Vietnam. We miss him very much, he is always in our thoughts. 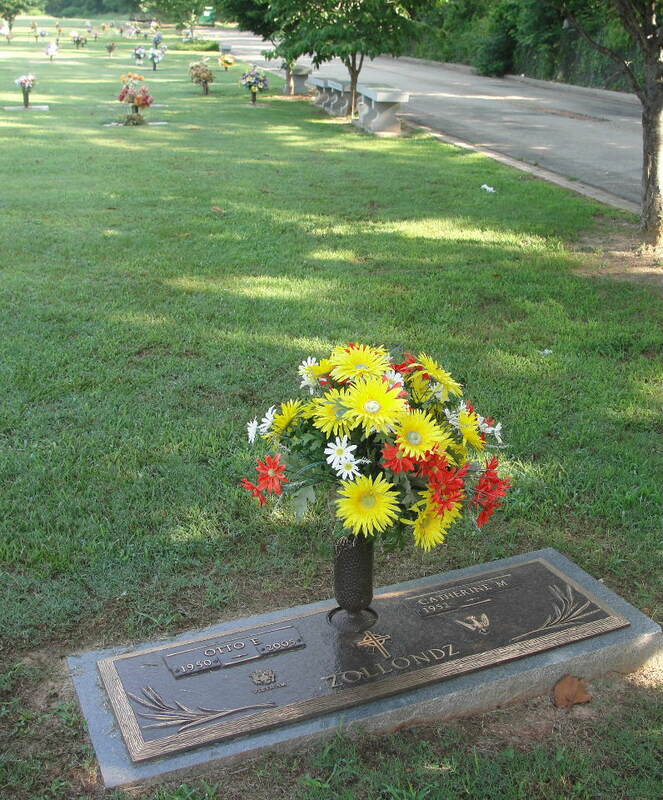 Thank you for designing the beautiful Memorial Site as a tribute to Otto and all other Charley Co. Vietnam Vets. I tried to send this message from your website, but was unable to get through. You know it really touches my heart to get an email from a family member of one of the Charlie Company men. The Battalion Motto founded back in 1943 is "We have a Rendezvous with Destiny" and we really didn't have a clue of what that meant back when we served. But, in looking back, it was then, and still is so true. It was surely Destiny that brought together this very unique group of guys. A group of men that was dedicated to watching out for each other in a very dangerous period in time, in a very dangerous place. Being an NCO (a Sergeant) while I was there, I saw so many good young men come and go. Many times throughout the years, I would pull out my old photo album in thumb through the pictures and wonder if many of the guys that I had left behind when I came home, had actually made it home themselves, and what had become of them. I was probably a lot like Otto, I didn't talk too much about my time in the Army. When a small group of my old Vietnam Vet buddies finally convinced me to finally come to a reunion event in May 2008. That event changed me, and while there we decided to reach-out for the other guys that we served with over forty years ago and see how many that we could find. Well we are currently at 94 men found and still counting. Somehow I don't think that Destiny is quite through with this group yet. It's really quite exciting to watch things unfold as they have since we created the website. This was a perfect example, here a old schoolmate of Otto's found our website in his search for Otto. Otto was a great guy, and the news of his passing sadden us all, he is really missed by many here at Charlie Company. I know that there is at least one another photo of Otto in the Gallery pages of Gary Gilliam album. Please feel free to browse through the albums in our Gallery pages. If it is OK with you, I am going to CC this email out to Gary Gilliam, a good friend of Otto's. Maybe he can share some particular moments that they shared together. Thank you again for your email and kind comments. My name is Margaret (Zollondz) Griswold, I am Otto's sister. I received the Tribute to Otto site from Otto's oldest daughter Megan. Thank you so much for such a wonderful website honoring Otto and the other guys in Charlie Company that he served with. I think of Otto daily, so when I saw the picture of him and the music and written tribute, it was indeed very touching. Like so many who served in Viet Nam, Otto really did not discuss his experience during that time of his life, so it is interesting to get a little peek into his world so many years ago and so far away. I am very appreciative of your efforts to find Otto, and I know Cathy and his family are also thankful for all you have done to create this special site that we can return to. If you have any other photos of Otto or some little tidbit about him, I know we would all love to see it or hear about it.